Hi there, name is Guy, i get to planes thanks to FliteTest crew. I decided to get rid of the rudder for this build. Yes, i had to add some weight to get the CG on the spot. The total weight of this bird is 198g in working order with this settings. I have to maiden it before i glue the front deck but i feel like the motor is too weak and it is too windy to maiden today. I think i would buy the Eflight park 180 2400 kv that use the same ESC as i already have, i spotted it on the web for 30 box or so. I would appreciate your thoughts about that. David and Josh, if you have any thoughts, about downsizing your designs please let me know. If it does feel under powered with the 2 cell then try a 3 cell if motor will take a 3 cell. I know nothing about this motor but just thinking. 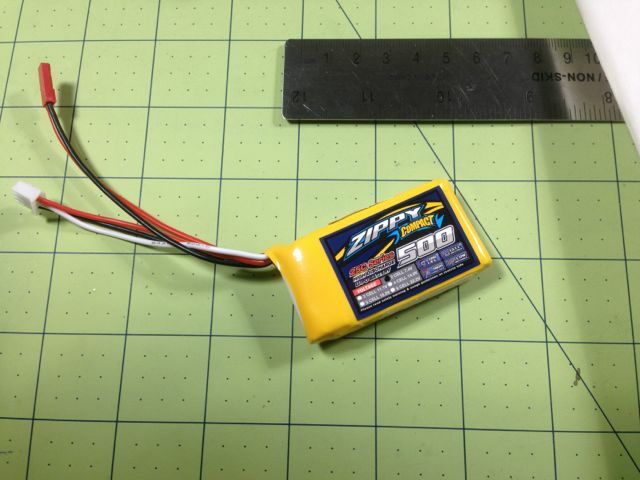 I agree with Ron B. I have some 500mah Zippy 3S batteries and they don't weigh very much. You'd get an increase in power without much weight gain. Alright, i dug more since my last post, on that subject. The thing is at the end, to know how to choose the proper motor, propeller, esc and battery set for your model, witch is a very interesting subject to go with. 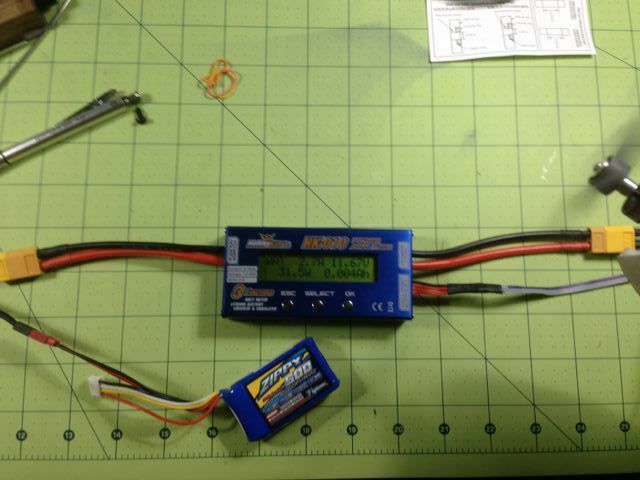 As a scratch builder, i definitly need a watt meter to check my power systems, this is going to be my next purchase. The HK-10 seems to do the trick. The Turnigy 130 watt meter is off so i will avoid it. Gt Power Rc LCD 130a High Precision Watt Meter and Power Analyzer might be a good deal, it is as the Turnigy 130 watt meter but the readings a right on this one. Do you guys have any advice for a good quality piece of equipment ? I think when people say that a watt meter is off, it's usually about 5-10% off. Which is still accurate enough to tell you what you need to know. 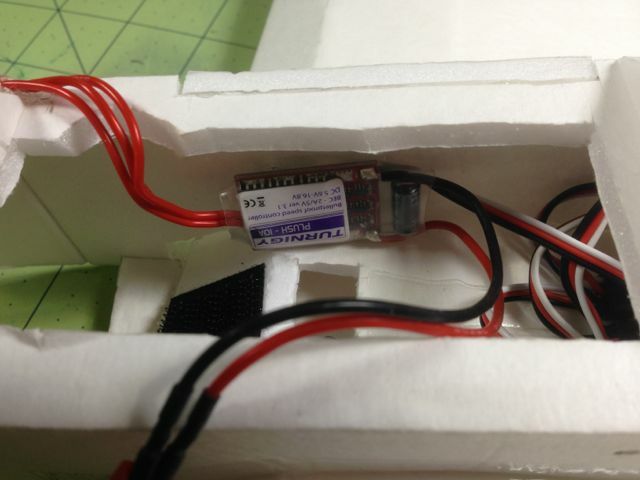 Plus, watt meters are generally used to find the most efficient prop for a motor. So as long as you're using the same watt meter, any watt meter would work because hopefully it would be off by the same 5-10% each reading. Even if you're checking for tolerances and want to make sure you're not drawing more amps than your ESC can handle, it's still fine if it's a bit off. The "80% rule" is a great rule to follow. You should only be using 80% of what any electronic is rated at. 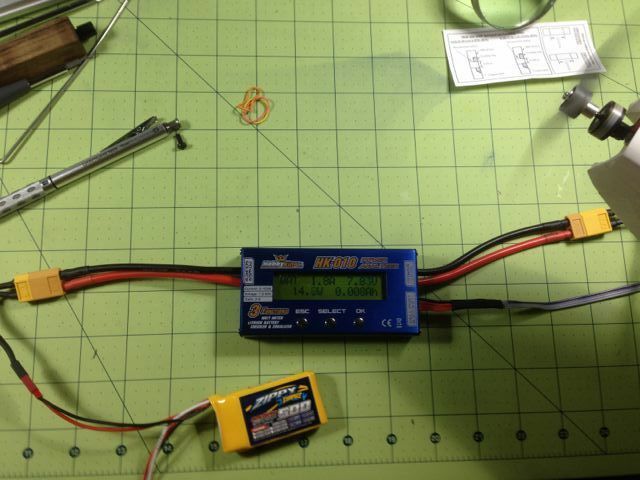 So if you have a 20amp ESC, you should only run 16amps through it to ensure that it lasts as long as possible. Point is, don't over think it. Electronic guys tend to be picky about tolerances and error rates. 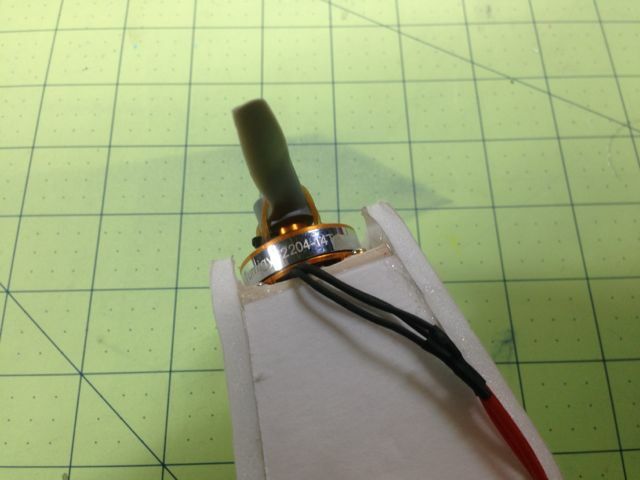 I looked on Hobby King's site at the motor you have and it recommends an 8x4 prop if you're using a 2S battery. Even though that doesn't go along with the racer look, it might be worth going with the bigger prop to give the prop more air to grab on to which will get the plane to speed faster. But not a faster speed. You might have to watch out for torque roll. Your current setup with an 8x4 prop might be worth a try. Maybe even try it as is before you start ordering new parts. The plane looks great and I hope you get it working. No need to get crazy about this watt-meter thing but i think there is certainly a need to get a watt-meter to control gears at full burst so you will be sure to not burn something over your 5-10 min flight, just don't need to be obsessed. 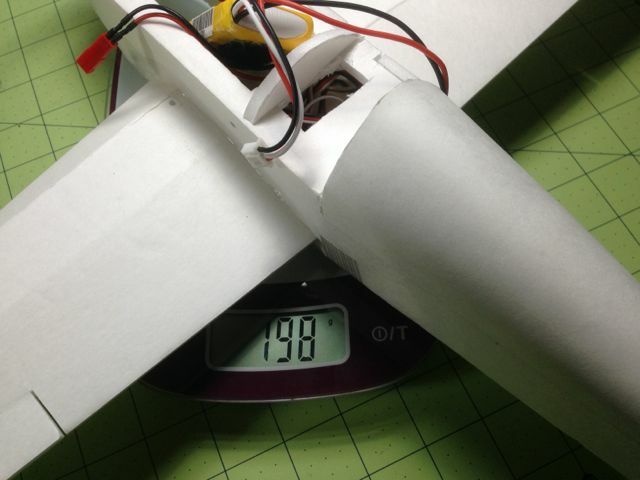 In my case, i bought the motor with its recommended ESC and battery, but i went for a 4.1*4.1 prop instead of the 8.4 recommended due to the scale. 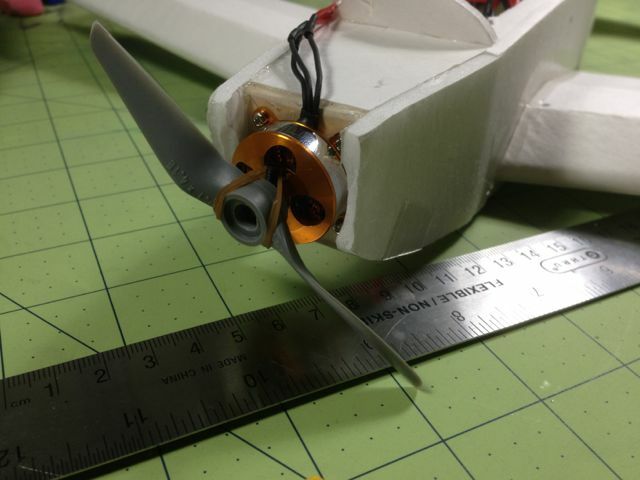 I don't know how is this setting is going to react at full throttle during all the time flight on 2s and worst on 3s (motor and ESC can handle 3s on paper). Watt-meter can help you only with gears you already have, because you can't test things you don't have in front of you. Point is, for new gear buyers, the manufacturers have to provide full characteristics witch tend to be the case now, but sometimes they do not provide enough information (you see this on HK reviews from time to time, people are asking for full motor characteristics). I also have followed your advises and went for 2*zippy 3s 500 mA in the same order - even if my actual gears can't handle 3s with the 4.1*4.1 prop, it will not hurt me to have them in my battery collections for other projects. I can't try a 8*4 prop on this plane because the plane is way to small for this prop !!! i think this would give me way too much tork and would concourse for ugliness ;-) A 8*4 prop represent close to half of the total size of the plane !! I'll then need to have a new post maybe to present my actual finished Spit, Racer, Ripslinger ;-) all airbrushed or this finished project. Thanks for the compliment on the built rcspaceflight. If i do good with this project, i'll post a video of the maiden for sure. And this will be thanks to your help. NB: sorry for my English - i am french so my English is faulty. Guy, no apologies necessary, your english is fine. I'm of no use on your concerns as I'm new to EP and my knowledge is useless. I would like to compliment you on your build though. Me thinks you'll have one zippy litle beauty there when you get your power sorted out. Cant wait to see it roar! Are you using the 5mm foam or did you go thinner? I am thinking of doing scale-down to but with 3mm foamboard. I went for 60% on my swappable builds as it's perfect for the 3mm Depron I use. The 3S powerpod has enough thrust to propel my 188g MiG-7 at over 92km/h (measured using HK's doppler app). I tried the Plush 10A, but it just didn't give enough top end. I'm not really keen on the APC style props for Turnigy motors, I had to use some heat shrink tube glued to one of the sizing rings to get a tight fit. I'm trying out the Turnigy Sport (TGS Sport 6x4E Precision propeller) next. I hope this helps in some form or another Guy. Hello Tophe75, yes i did use exactly the same $tree foam board for this project. -I wanted the 5gr servos to fit as good as the 9gr servos in the wings = they did: they have been sandwiched between the upper and lower part of the wing tightly. -I wanted all spar holes to accept natively (after the shrinking process) the width of one sheet of $Tree board (4mm). The shrinking process contribute to a tremendous amount of rigidity for the whole thing !!! i think this is going to be able to handle L O T of crashes. Much more than a regular plane bought in the market. For information, they are actually priced within 99$ and 150$ for this size. If i get the right gears and if this is flying. This could be fantastic to play with !! for less than 50box !! Hello Freaky_1 Thank you for your support, i appreciate it ;-) As i just scaled down the plane and remove the rudder, i have no clues if this is going to work as good as the the original. Maybe shrinking things this much changes the behavior of the whole thing. This is going to be a surprise, but i will at least know and let you guys know what is going on. If it does not work for me as it is, i will follow your path and rebuild one at 55% scale but with 3mm foam so the power system will have more latitude to express itself. Hi Randall_l, thank you for your input. Can you tell me where you did get your 3mm depron ? For the motor, i was thinking of ordering the Eflight park 180 2400kv motor witch has the same characteristics as the motor furnished by HITEC with their ZIPPER. I am glad you just confirmed that would have been a good move. Do you have any videos of your two settings working with those props ? My local hobby shop had a bunch, but I bought the last of it and they won't be getting any more. They got it from rcfoam.com, which is where I will make my next order from. I haven't received the Turnigy Sport props yet. I'm afraid I'm the only one in my village that flies, so finding camera persons is a bit difficult. I do have a fairly bad video of the MiG 7 with a 2S battery on my YouTube channel (http://www.youtube.com/watch?v=pYQr0YL8PYI). This spring, I hope to get my hat mounted camera tuned so it's usable. It'd be nice to share some of my fun. I checked you video on YouTube, you did good ;-) i wish you had some closer footages of the plane itself but you did good. This is a powerful system you have there !!! I hope more people will get involved in your area, i myself try to get people in this hobby and at this same moment i am helping a friend to scratch built a design. Aw heck. The "reply to thread" got me again (much more attention grabbing than the "Post Quick Reply" button). 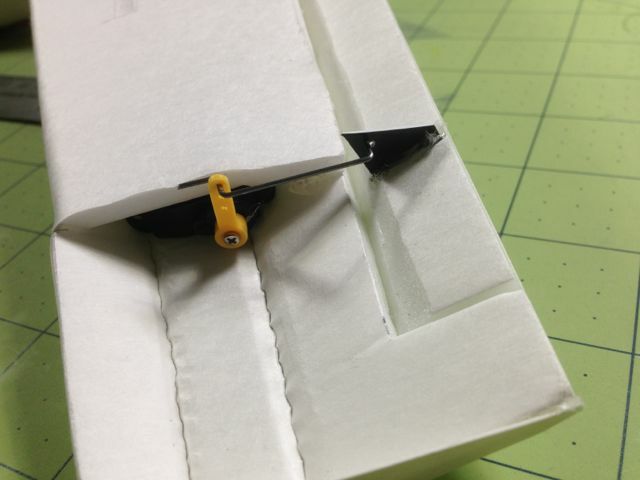 I had quite a bit of difficulty flying inside the box that my iPhone provided. It's such a fast plane even on 2S and with flaperons as down as I dared. I've got one prospective student, but I think they're going to wait until spring. I've made the offer and I've been reading up on the MAAC training exercises. I got a wireless buddy box unit in my Christmas stocking so I've built another 2S pod for it--just have to plug in another receiver and go. The weather is so bad i can't get my fingers on my radio for more than 10 min, as i am in a test phase of this project, this is not easy. I wish you the best for this summer anyways. NB: Do you by any chance live in France ? I was waiting for my orders to come in so i can update this thread. I did receive my HK-010 (watt meter tester) and i am very happy with it as it comes with built in balancer, Lipo tester also for the most interesting parts. Max current on the 2204-14 is 7.5 Amp if i believe HK www, and burst current on the ESC is 12 A so if i understand correctly, i am WAY under the limits of those components. I then tried to fly on 3s - (Turnigy 2204-14T/4.1*4.1 APC prop/Plush 10A): Power was much better than on 2s but i think this is still not enough. Plane was going down every time even when throwing in front of the wind. I tested the Eflight parc 180 and i hooked it up with the turnigy plush 10A this morning instead of the Turnigy 2204-14T i still have. 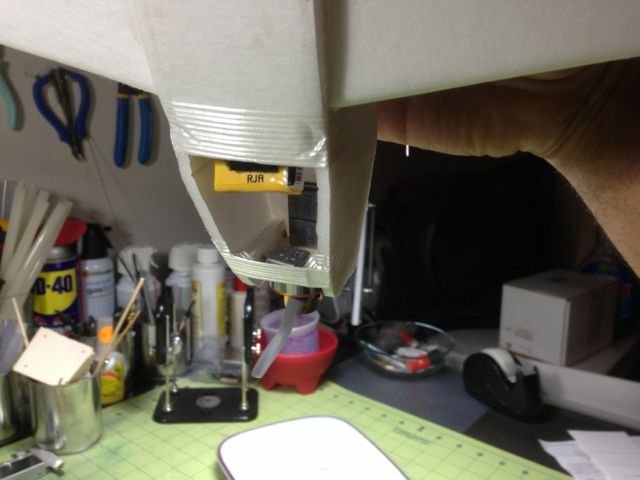 Eflight Park 180 Motor spec says it is ok up to 30watts so it is just on 3s... though I think it would handle it because o the good ventilation an because i assume the manufacturer does allow itself some range on that parameter. I may have to go for a 6.4 prop instead of my 4.1*4.1 - what are your thoughts about that ? I am a bit discouraged actually because i can't get this thing in the air and i did spent some dollars. 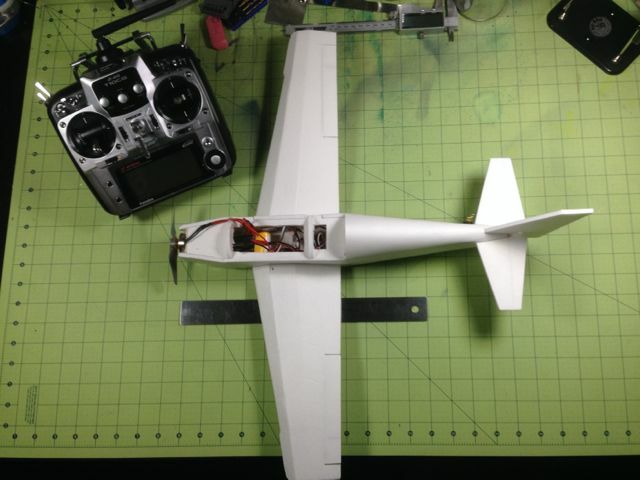 I might have bought undersized motors/propeller/ESC for this project. I am still willing to go on to find the right power system. For the gears i already have, i might need to find other projects like indoor flights. 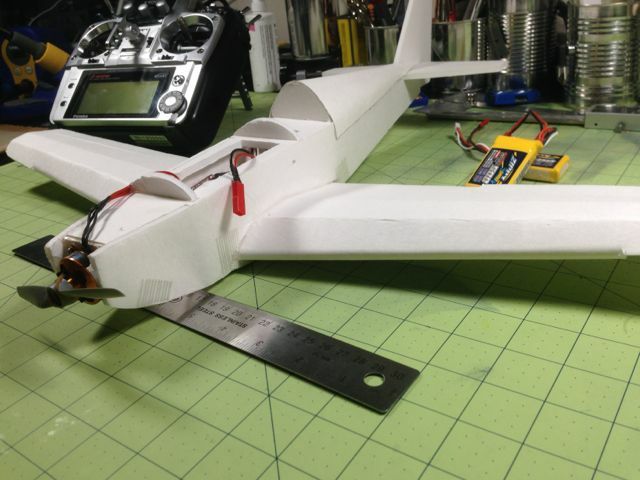 The ailerons look about right for the size of the wing. The faster it flies, the less control movement is needed. HobbyKing recommends an 8040 or 7035 for the 2204-14T, so a 6x4 may be a little small for 2S. On the other hand, it'll certainly help keep the current draw down on 3S. It sounds like you're going through a similar learning curve to me. I did a lot of research, ordered a bunch of stuff and it's still sitting in my parts bins today. Don't get discouraged. The lessons I've learned along the way were well worth the extra hardware in the end--and I'll find a home for it at some point. The whole community here is very helpful and encouraging, so if I can't help you there will be someone else who can. With that said, what can I do to help? Sorry friend--not even on the same continent. I live in Ashcroft, BC Canada. I recently extended my cold-weather flying down to -15C. I ordered the Turnigy Transmitter Glove and HobbyKing Universal Heater system. It works great on the 2S 2200mAh batteries I have, but only lasts about 15 minutes before the low voltage alarm I place on the balance lead goes off. It's enough time to walk to or from work (I usually fly one of my Old Fogey's to/from work). It has however, been windy enough to ground me this past week. I'm starting to make headway on other projects, so it's been a good thing.